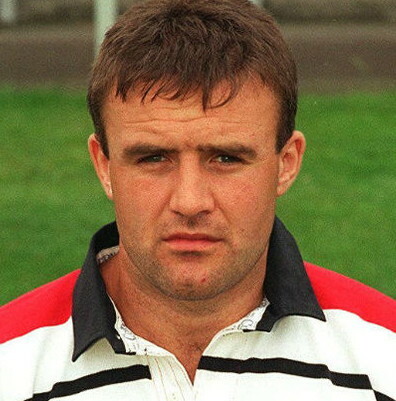 Martin Roberts played 121 games for Gloucester, first as a goal-kicking full back and later as a robust and determined centre, between 1989 and 1998. He also played for Cheltenham, Moseley, Pertemps Bees (Birmingham) and Cinderford. Martin Roberts was born in Gloucester on 26 January 1968. His parents came from the Forest of Dean. The family moved to Gloucester and he was educated at Parton Manor Primary School, Churchdown and Chosen Hill School. His first love was football, but at Chosen Hill – a “rugby school” coached by Dave Protherough of Moseley and Adrian Turton of Gloucester he was converted to rugby. He played rugby for Gloucestershire Schools and then joined Cheltenham Colts at 16. Martin made his debut for the Cheltenham 1st XV as a 17 year old in 1985 and was a first team regular from 1986-89. His first appearance for Cheltenham at Kingsholm was on 12 November 1986 at full back in a match which Gloucester won 36-13. His last game for Cheltenham against Gloucester was in the centre at the Prince of Wales Stadium on 15 March 1989. This was to be Cheltenham’s last victory over the old enemy, a win by 19 points to 16, after losing 48-3 at Kingsholm earlier in the season. Martin Roberts joined Gloucester as a centre for the 1989-90 season. He made his debut against Stroud on 5 September 1989, scoring a try under the posts, but competition was fierce both in the centre and at full back in a hugely successful season for the club and he only played three more 1st XV games, two as replacement. The following season he had a more extended run in the first team at full back and made his Courage Championship debut against Harlequins in front of a packed Kingsholm on 27 April 1991. He kicked 14 points in a 38-19 victory. In all, he kicked 92 points and scored 4 tries in the 11 games he played. Still regarded as a goal-kicking full back, Roberts made a breakthrough in 1992-93 when he played 21 games and scored 157 points, including 7 tries. He played in the victorious Gloucester team which toured in Ireland, winning the Kinsale Sevens. The following two seasons he played as a utility player, filling in at full back, centre or, on occasion, on the wing. Then in March 1995 centre Simon Morris suffered a cruciate ligament injury and so began a centre partnership between Martin Roberts and Don Caskie, which took Gloucester through the two key seasons between the start of the professional game and the arrival of Tom Walkinshaw at Gloucester. Roberts started 17 of the 20 league games in 1995-96 and 18 out of 22 in 1996-97. It was a difficult time for the Gloucester Director of Rugby Richard Hill and a nail-biting time for the Gloucester fans as a largely locally recruited team on a limited budget fought for survival. None fought harder than the centres Caskie and Roberts. Roberts played his part in some remarkable games during those two years, notably wins against Bristol, champions Bath and relegation rivals Saracens, in front of packed houses at Kingsholm in April 1996 and a run of seven home victories against all the odds the following season, culminating in a 32-30 victory over Leicester which put paid to the Tigers’ chance of winning the championship. 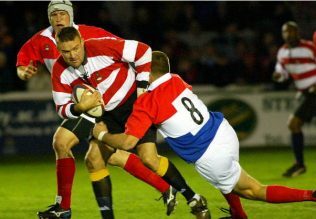 With the arrival of international centres Richard Tombs and Terry Fanolua in the summer of 1997, opportunities became limited and Roberts played only a handful of first XV games in 1997-98. He decided to join Ian Smith at Moseley, where he stayed for two years, captaining the side to a crucial 18-16 victory over a Worcester team containing several of his former Gloucester team mates at The Reddings in April 1999. He moved to Pertemps Bees in January 2000, making 43 appearances in two seasons and acting as vice captain, before joining Cinderford in 2002-2003 as player and backs coach. He has also coached at Hereford and Chosen Hill. Martin Roberts had continued to be very much involved as a player in international veterans 7s rugby and had toured worldwide. It came as a great shock to the rugby community when he died suddenly at the age of 48 after coaching at Chosen Hill on April 9, 2016. The Gloucester crowd applauded for a minute in tribute to Martin before the victory over Exeter Chiefs on the following Friday evening.